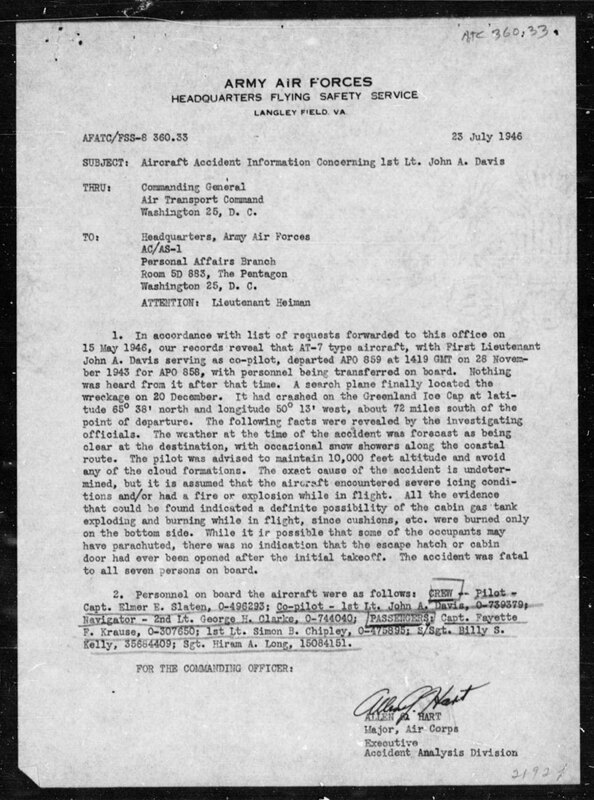 On the top of page 10 of https://media.defense.gov/2017/Jun/2...UETAUB2011.PDF) it says an AT-7/C-45 was lost in the rescue attempts of the crew of B-17 42-5088. This B-17 came down on 9 Nov 1942 while searching for C-53 42-15569. Latter a/c had crashed on 5 Nov. 1942. \nI wonder who can identify the AT-7/C-45 of 5 Jan 1943 in Greenland? \nThe 5 men on the C53b were never found. \n Their date of death is given as 30th November,1942(?). \nS/Sgt. Eugene L. Manahan - 16015496. \nCpl. William W. Everett Jr - 13043466. \nCpl. Thurman Johannessen - 18057650. \nThe a/c was with the 29Sqn of the 8th Ferry Group. \nMACR 15896 has on Fold3, only two pages, the first with the number and the second has the names. \nFor the other accidents perhaps Craig at AAIR could supply copies of any accident reports on the a/c involved . \r\nThanks, but I\'m specifically after the AT-7/C-45 of 5 Jan 1943. \r\nNo record on aviationarchaeology or accident-report.com, nor a MACR. \nW/O November 28, 1943 in fatal crash, Greenland ice cap. \nTo excess inventory list Narsarsuak, Greenland, December 1945. \nThe relevant part\'s are "W/O", "fatal crash" and "Narsarsuak, Greenland". Here are the details on 42-43480. I don\'t think that it is the correct plane. \nThe date is a year out I know, but it seems to be the only fatal C45/AT7 crash noted anywhere. \nI just wonder if the take off and crash date was 1942 and a typo some years later when the typed report was made the 42 became 43 ? \nOtherwise the crash would fit in the time frame. \nAlso the crew were MIA\'s and date of death is given as 28th November 1943. Surly it should be 28th November 1942 ? See Captain Elmer E. Slaten O-496293 1st Resque Squadron, in AMBC. \nIf we take the t/o date as 20th November 42, then a/c sighted date as 20th December 42, then resque/recovery team reaching the wreck on the 28th December 42. Then maybe the crew were recovered on the 5th January, 43 ? \nDate of death almost a year+ 1 day. Found this story on http://tailspinstales.blogspot.be/20...-when-you.html (see under "Know Where You\'re Going When You Volunteer") pointing to the second ski-equipped AT-7 sent to Greenland for the B-17 crew rescue efforts. \nPilot was Benjamin H. Shiffrin, then with the 103rd Observation Squadron, Fort Devens, MA, but he volunteered for the Greenland mission. \nThis all was in late Jan 1943, so after the apparent loss of a first AT-7/C-45 on 5 Jan 1943. \n42-43480 indeed not the AT-7/C-45 involved. See http://www.warcovers.dk/greenland/crash431128.jpg with official records. \nReason of flight (also) not for search efforts of the crashed B-17. \nRe your post 7, that was my point in my earlier post. The official document was made in 1946, see date on document. \nHence my "possible train of events" to support 42-43480 as the a/c involved. \nOtherwise there must have been a third a/c ? \nHere is a little on the Barkley-Grow. I received word from Capt. Donald M. Taub, USCG (Retired) about the possible AT-7/C-45 loss on 5 January 1943. \nHe is the author of the article “The Greenland Ice Cap Rescue of B-17 PN9E” in which a/the 5 Jan 1943 accident was mentioned. \nCapt. Taub’s source was information from one of Colonel Bernt Balchen’s personal notebooks. The notes however were very brief and it merely said that the aircraft was lost between BW-1 and BE-2. \n I further read that Col Balchen (also) had a YC-64 Norseman (42-5044 called “Yellow Peril”) which reportedly was destroyed when a nearby C-87 transport (41-11704?) burned out, late 1942-early 1943. But I still have to dig deeper here for confirmation of this. \nIdea of confusing the story and fate of the Canadian lookalike with a possible AT-7 of 5 Jan 43 had crossed my mind as well. \nOne of the occupants (Capt. Moe) was USAAF, I believe. \nAlex: report of 1946 clearly speaks of a crash on 28 Nov 1943 and not 5 Jan 1943. The navigator on the flight was probably Captain John G Moe, Jr., AAF. (Captain Moe, navigator AAF is mentioned in the link I gave). \nI know he was a navigator, having received his wings in June, 1941. \n"Captain John G Moe Jr, 26, who recently was awarded a Distinguished Flying Cross for a "hazardous flight in a bombing plane from Washington to the Netherlands (East Indies) on an urgent and vital mission has been found after being reported missing on a recent flight his father, a justice of the peace, of 450 S Orange Street, Media (PA) said yesterday. \nIt looks like the Army informed his father on the same day (January 2) he was found. \nUpdate: found another newspaper article which confirms this. It states that John G Moe had an harrowing experience in late 1942 when he was forced down in Greenland while searching for some missing flyers. He spent Christmas of that year in a rubber boat amid the ice flows of the northern Atlantic. I wonder who can identify the AT-7/C-45 of 5 Jan 1943 in Greenland?